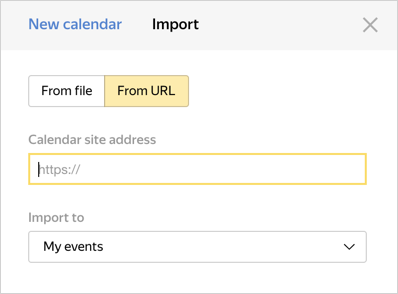 You can import calendars from other sites or resources to your Yandex.Calendar. The source of the imported calendar can be an external link (URL) or a file in the *.ics (iCal) format. Under the Import via URL tab you can enter the calendar site address in the iCalendar format (for example, http://www.example.com/calendars/calendar.ics) or under the From file tab select a file from your computer. 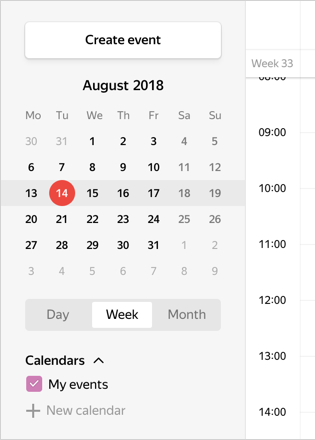 You can also add events to your calendar from a file that is in the *.ics format.